We decided to paint the kitchen ourselves this past weekend. The quotes we were getting to do the job seemed over the top ridiculous. Personally, I enjoy painting the rooms of my dwelling space. I have learned to detest wallpaper and love the instant gratification of paint. Unless something technical needs to be done; I can paint walls and cabinets like a pro. Based upon what we found while doing this project, we certainly did it better than the last “pro” who was hired to paint. I love doing it. There is another mental space I go to when doing these kind of projects. It is a fun place to go and I don’t stay long so it is best to take advantage when it comes around. “Let’s go buy paint and get going ” we discussed one morning. So off we went to the paint store to buy what we needed to transform the kitchen. Robert was amazed as to how much we actually were able to do in a days time. We began on Saturday, mid-morning, and finished Monday around dinner time, after work. Over last weekend we dismantled the kitchen; removed cabinet doors and hinges; and such. This is how the sequence went: Degrease, wash, dry, sand, damp mop dust, dry, prime, paint 2 coats, let dry. The kitchen is now back in working order and feels great to be cooking again. Presto Chango. Gotta love it. The entire dish is easily made in the time it takes to cook the pasta. 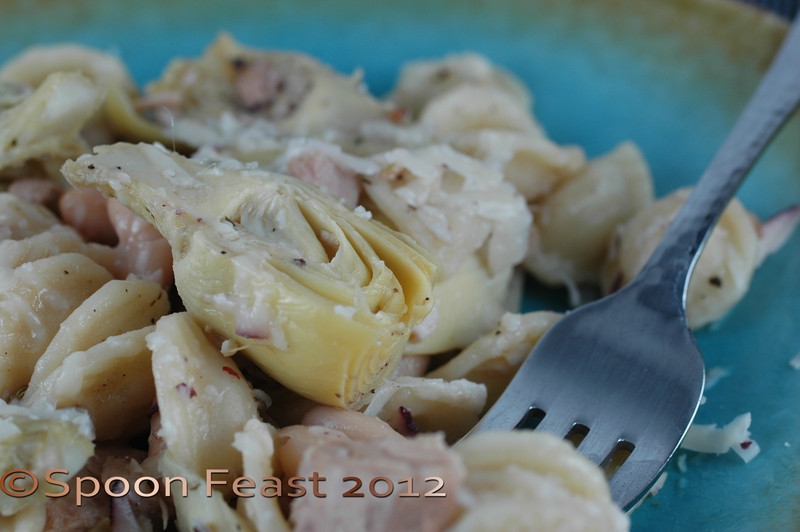 Cannellini Beans, canned tuna, artichoke hearts, lemon and pasta and cheese if you like. 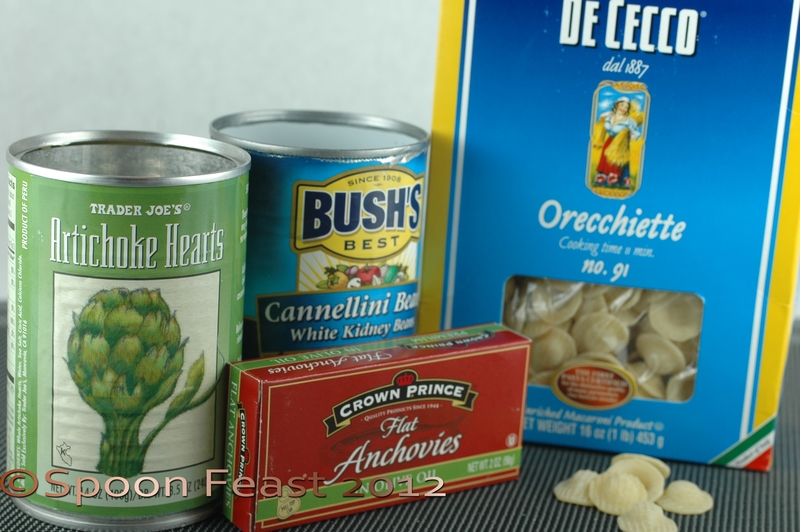 These are the major ingredients: Artichoke hearts, cannellini beans, anchovies, pasta, here we are using “orecchiette” and Tuna, which is not pictured. Bring the water for the pasta to a boil, salt the water and add pasta. Note how long the pasta takes to cook so it does not get over done and mushy. Heat a large pan over medium heat. Add the anchovies and saute until they “dissolve” while being cooked. Add the onions and garlic. Saute until the onions are soft and the garlic is fragrant. Add the artichokes, beans and tuna and chicken stock. Bring to a simmer. When the pasta is done, drain and fold it into the pan with the other ingredients. A salad on the side rounds the meal out nicely. This entry was posted in basic skills, Recipes, To Tyler: How to Cook: and tagged Artichoke, canned tuna, cooking, dinner, Fish and Seafood, food, pasta, Tuna, White Beans. Bookmark the permalink. Thanks Uru! I found myself hunting the ice cream in my freezer after reading your last post. I am glad it is summer here! I keep thinking about hot fudge sauce. . . Nothing beats a quick recipe that won’t mess up the kitchen. This recipe looks wonderful. I couldn’t help but notice the Trader Joe’s label on the artichokes. Isn’t that the greatest store? Yes, it is! The one by us is so popular it is hard to find a parking space. But when you do, it is a great place. Oh that’s too funny. It’s the same by us!! Yes! One of the reasons I don’t mind painting. I feel as if we are just moving in. Things don’t need to go back from where they came. Change up the artwork and yes indeedie! A new room! And I’m the luckiest one yet-I get to be friends with Chef Pamela and her darling partner, Robert, and then I get to enjoy the meals, also! And this one was fab, Pamela and the kitchen looks marvelous, darling! Thank you Pamela and Robert! As always, you are welcome anytime!